NEW YORK, USA -- Buddha is everywhere in the Metropolitan Museum of Art's Asian galleries. 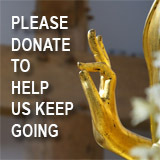 << Right now is the time to come and see another masterpiece of Buddhist art. It's not under glass so you can get up close to a Japanese painting from the 14th century. You will see Buddha, the central, spiritual figure of Buddhism, one of the world's major religions, in all sizes here. Associate Curator Denise Leidy points CBS 2's Dana Tyler to one of Museum's classic examples of Buddha from India. "The sculpture we're looking at here is one of our Indian masterpieces. It dates from 460 to 475 and is considered to be a classic image of what a Buddha would look like, So that it has a balance between absolutely, physically present being, but if you look at the face, the eyes are looking down, it seems to be introspective. 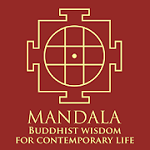 You get a sense of the person who was there but had somehow moved beyond mortal concerns which is course exactly what a Buddha is." Tyler and Leidy checks out the adjoining galleries, and find two colorful examples of Buddhist disciples from China, dating back to 1000 A.D. The sculptures are part of a group of sixteen that were found in a cave in China in the early 20th century. Leidy tells Tyler that the Met is lucky to have them, the others are in museums in China and Europe. Buddha also makes a big impression in a 14th century painting that once covered a temple wall in China. Surrounded by regal figures, known as Bodhisattvas, this Buddha represents medicine. In Buddhism, by the way, a Bodhisattva is an enlightened being who stays in the world to guide the rest of us. "This is a late 6th century piece from China, it's so large it must have been placed at a crossroads or something very public, so you could imagine being in China at that point in time and walking on a dusty road and seeing it there and remembering it symbolizes compassion and feeling very assured." Right now is the time to come and see another masterpiece of Buddhist art. It's not under glass so you can get up close to a Japanese painting from the 14th century. It depicts the death of Buddha. While a few people in the painting know that Buddha's death is actually a good thing, almost every other image, human and beast, is in despair. Leidy tells Tyler the Met displays this work at this time of year only, when it's believed Buddha died. "This was his final lifetime, and now he's transcended all mortal concerns. Most of his followers don't see that .. you've got this elephant writhing in pain on his back, you've got this monkey depressed, in the upper right hand corner you've got his mother coming down from heaven, it's kind of a way station, she's crying so eyes are covered." 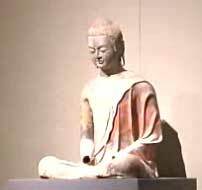 Visitors to the Metropolitan Museum of Art can explore the many forms of Buddha in the Asian Galleries.